This Endless Love Stainless Steel Black and Gold Heart Cubic Zirconia Pendant Necklace Couples Set is currently selling for just $39.95 on Amazon.com! You will be saving 65% off the listed price of $114.95 with this jewelry deal. This couples pendant set comes with an 18" chain, plus your choice of a 20", 22", or 24" chain. What a romantic Valentine's Day gift this necklace pair would make! 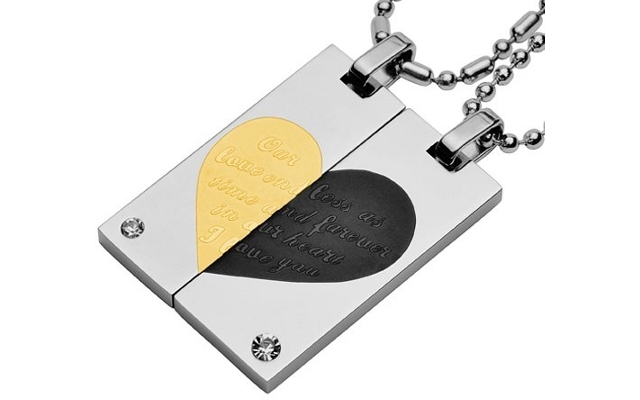 When put together, the pendants read "Our love endless as time and forever in our heart ... I love you"